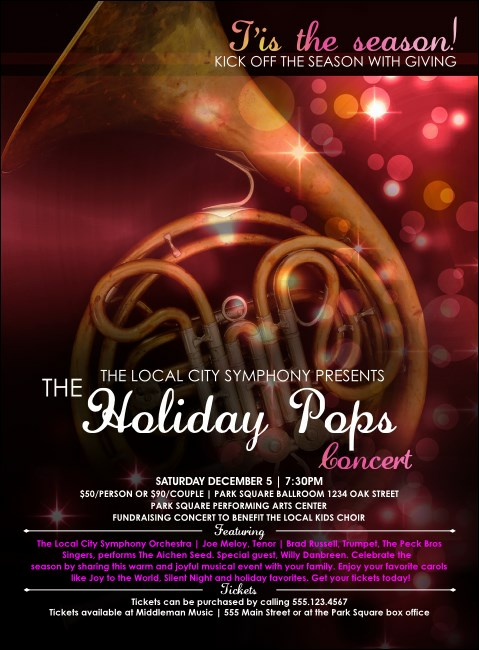 Give everyone the chance to hum along to their favorite Yule time songs when you advertise in advance with Symphony Holiday Pops Flyers. These chic Flyers feature a beautiful French horn on a background that glitters with pretty pink and gold lights. Include all your holiday event details on the template with eighteen lines of pink and white text. Uncork the best seasonal event advertising you can find at TicketPrinting.com.